Creative adventures inspired by books, research and local heritage…. A project between artist and film-maker Joanna Mayes, Cornwall Libraries and a number of South West artists. The Loop the Loop programme gives you the chance to explore your local library through film, installation, music and performance. Throughout the process, Joanna will be documenting occurrences using 16mm film, processed in the library, using instant coffee (caffenol). See the Loop the Loop events page for details of events at each library. 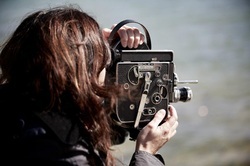 Jo Mayes is a founder member of CineStar artist film group and is currently creative producer/director of Loop the Loop – creative adventures inspired by books, in association with Cornwall Libraries, ACE and Feast Cornwall.